Two celestial events will give amateur astronomers in Vancouver a reason to look up later this month. The Lyrid meteor shower is expected to be visible starting around April 16, according to the American Meteor Society. Shooting stars should be visible until about April 28. The AMS predicts the peak to be overnight from April 21 to 22. However, a bright waning gibbous moon may affect the number of meteors visible from Earth. In general, those craning their necks can expect to see about 10 to 20 meteors an hour at its peak, astronomy website EarthSky says. Surges of as many as 100 meteors per hour have been reported a handful of times. For the best chance of seeing shooting stars, it's recommended to find somewhere as far from city lights as possible. The Lyrid meteors are named for the constellation Lyra the Harp, which contains the brilliant star Vega, though the source is actually Comet Thatcher. "Around the Lyrids' peak, the star Vega rises above your local horizon – in the northeast – around 9 to 10 p.m. local time," EarthSky says. "It climbs upward through the night. By midnight, Vega is high enough in the sky that meteors radiating from her direction steak across your sky." The Lyrid shower is among the oldest of known showers, and is said to have been observed in the year 687 B.C. A pink moon is also expected to be visible before dawn one morning during the same timeframe. The Old Farmer's Almanac predicts the phenomenon to be visible on Friday, April 19. But just as June's strawberry moon isn't actually red, and March's full worm moon looks nothing like the invertebrate, the moon isn't actually pink, despite its name. It was named for phlox, a type of pink wildflower that grows early in the spring in North America, the almanac says. 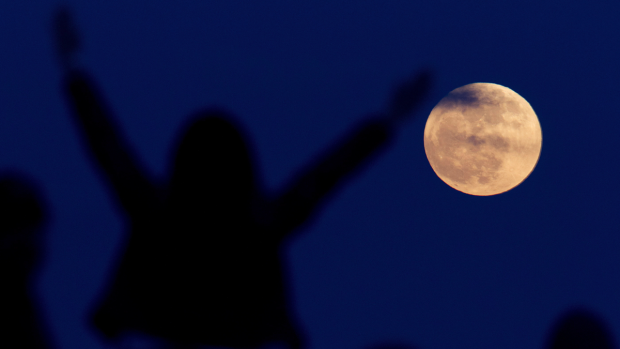 April's full moon is also known as the sprouting grass moon, the egg moon and the fish moon.